Steve Sisolak at the Nevada Day Parade in Carson City on Oct. 27, 2018. Photo by David Calvert. 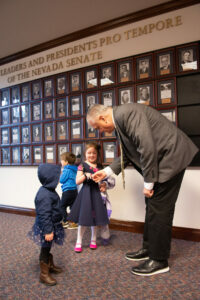 On the morning of the first day of his first legislative session as governor, Steve Sisolak was squatting on the floor of the legislative building in a suit and leather-topped sneakers high-fiving children. Unlike Secretary of State Barbara Cegavske or Lt. Gov. 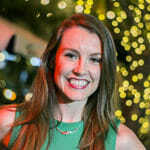 Kate Marshall, Sisolak was incidental to the day’s proceedings, which largely consisted of lawmaker swearing-ins and mundane legislative business. But instead of holing up in the Capitol as snow swirled outside, the newly inaugurated governor had decided to hobnob in the halls of the legislative building. His presence marked a departure from the distance that his predecessor, Republican Gov. Brian Sandoval, put between himself and the legislative process. Although Sandoval also set a goal after he was elected to meet with every lawmaker, he was more likely to summon lawmakers to the Capitol for formal meetings in his office. Sisolak made the short walk across the snowy courtyard to meet with lawmakers on their own turf. The gesture didn’t go unnoticed by lawmakers on either side of the aisle, several of whom tweeted out pictures of their meetings with the governor. But the man-of-the-people persona he’s exuded in his first several weeks in office as he and his wife have embarked on an eating tour of Carson City and toured the rural portions of the state belies the reputation Sisolak earned as a headstrong negotiator in a decade serving on the County Commission. Those who have worked closely with him describe him as someone who not only won’t back down from a fight, but will sink his teeth in further when challenged — qualities on display in a battle with firefighters over their sick leave system and a clash with ride-sharing companies Uber and Lyft. Although former commission colleague Tom Collins characterizes his style as bullying, primary opponent Chris Giunchigliani said he can be “controlling” and critics see his frequent public and media appearances as evidence of egotism, his supporters view him as accessible, a tough fighter with the wherewithal to lead the state. What remains to be seen is how Sisolak’s style translates to his new role as the state’s top executive, where he’ll have the final say in heated debates on gun control and collective bargaining for state workers and power to shed more light on the mostly opaque cannabis and pharmaceutical industries. In his first days in office, he flexed his political muscle with a sharply worded statement, a self-assured press conference appearance and a series of legal maneuvers when the federal government shipped plutonium to Nevada without consent. 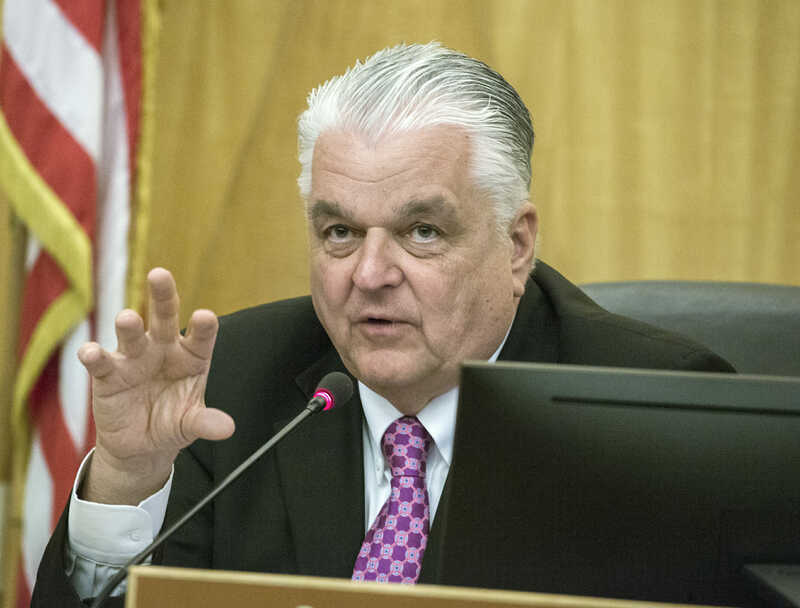 Ron Knecht, a Republican former state controller who served on the Board of Regents with Sisolak, said he’s seen both the friendly and forceful sides of the governor. Sisolak has touted his fiscal conservatism in the past. He put that aside during the gubernatorial primary when he sought to win over the hearts and minds of progressives, but people who have known him for years say budget hawkishness is his default. As a member of the Board of Regents, Sisolak earned a reputation for “crunching budget numbers,” a skill he told the Las Vegas Sun he was looking forward to applying to the County Commission. Commission Chair Marilyn Kirkpatrick says it will serve him well in his current role. 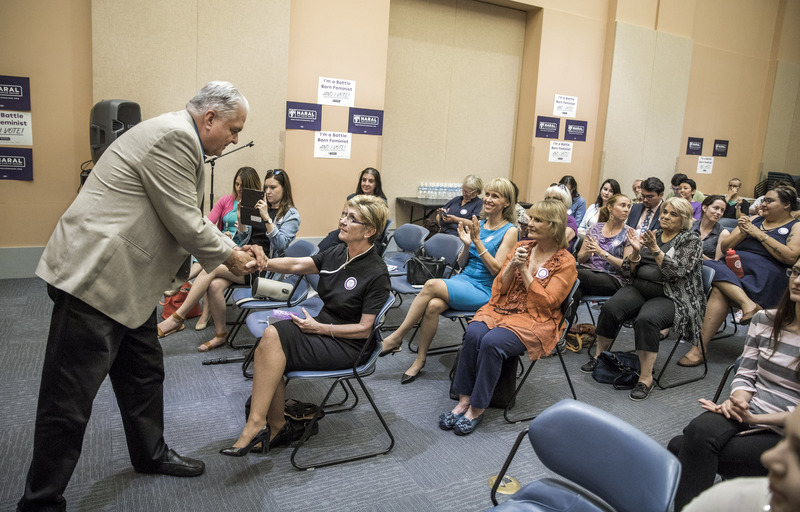 When Sisolak took office as a county commissioner in 2009, he became part of the first all-Democrat commission the county had seen in 40 years. It was also a time of great scrutiny on spending as the extent of the recession became more clear. Sisolak was supportive of the county’s efforts to whittle down its budget during the recession, saying that the county should be a good steward of taxpayer dollars in good economic times as well as bad ones. After all, local government employees who have the right to collectively bargain generally make significantly more than state employees who don’t, according to state-sanctioned salary studies. He questioned the many opportunities county workers had to boost their pay. The county considered a host of proposals to cut its budget, including streamlining business practices, shifting the burden of providing social service assistance to the state and abandoning licensure of certain types of medical homes and offices. But then came the hard part — the layoffs. Sisolak proudly proclaimed during his State of the State address that he would not raise taxes in his budget. Although his campaign opponent, Adam Laxalt, tried to frame him as a tax-hiker, some of the battles he’s best known for on the commission had to do with resisting tax hikes. One of the drawn-out sagas during Sisolak’s tenure on the commission was More Cops, a half-cent sales tax increase narrowly approved by voters in 2004. While the first half of the increase took effect in 2005, decision-makers opted to delay the second part of the increase because it was scheduled to take effect in 2009, just as the economy was tanking. Over the next few years, Sheriff Doug Gillespie tried repeatedly to persuade commissioners to raise the tax in hopes of hiring another 101 officers. Proponents argued that when accounting for the area’s visitors, Clark County had 1.58 officers per 1,000 people, while the average in North America was 2.42 officers per 1,000 people. But Gillespie could not persuade Giunchigliani, a county commissioner at the time, or Sisolak, a member of Metro’s fiscal affairs committee, who questioned why the department wasn’t drawing more on a hefty reserve account. “It’s about the trust that people have in Metro and the transparency that they feel Metro either has or lacks,” Sisolak said in 2014 during an interview with conservative talk radio station KXNT. The tax gained traction later when it was part of a package of bills the Nevada Legislature approved in its effort to lure the Raiders to Nevada. Sisolak, in turn, voted as a member of the commission to enact the tax hike, telling KSNV that many of the most powerful business interests in Las Vegas were on board. “I got calls from Mr. Wynn, Mr. Murren, Mr. Adelson, Mr. Jenkin, Mr. Ferttita amongst others all emphasizing how important this was,” Sisolak said, referring to casino executives. But the fight against police funding did not win him fans all around. Sisolak was known for drilling into the details when handling commission business, questioning what the county was receiving from its contracts with consultants and why contracts were renewed without going out to an open bid. In one instance, he pointed out that an architect who was the husband of a Clark County civil engineer had won hundreds of thousands of dollars in contracts in an apparent violation of state law. His reputation as a fiscal watchdog has influenced how others in his orbit work with him. Tina Quigley, general manager of the Regional Transportation Commission, said she advised her staff to be fully prepared before any meeting with Sisolak because he’s someone who always does his own homework on issues. “He is not afraid of learning the details and asking the hard ‘why’ questions,” she said. Sisolak struck Quigley as someone never content with being average and never daunted by confrontation. 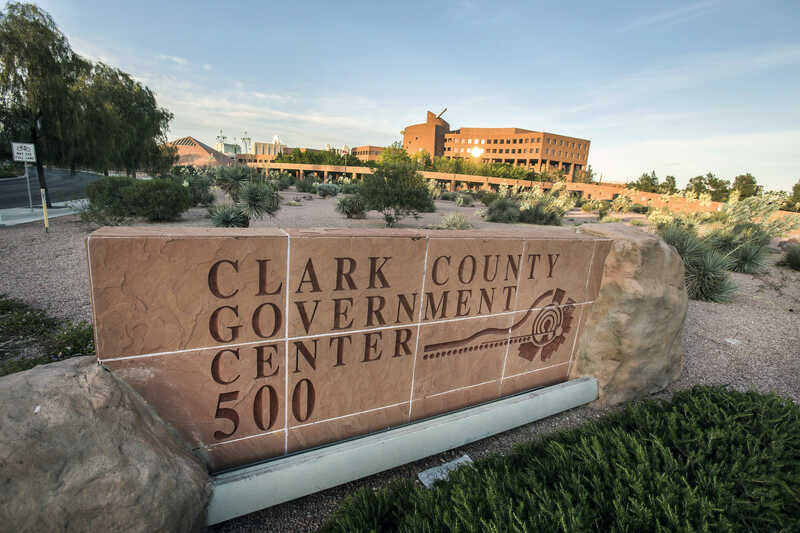 Clark County Government Center as seen on Thursday, April 27, 2017. Photo by Jeff Scheid. Sisolak’s feud with Clark County firefighters began in 2009, his first year on the County Commission. He said he received calls and emails from constituents asking why pay or benefit cuts for unionized firefighters, who were making an average of $180,000 a year in salaries, benefits and retirement packages, weren’t on the table in the cost-cutting blitz. The county considered “brownouts” — taking a fire truck or station out of service on a rotating basis to cut costs — to balance out the high costs of firefighter salaries. When contract negotiations between firefighters and the county stalled, Sisolak sunk his teeth into the firefighters’ sick leave policy, accusing them of gaming the system by calling in sick so their coworkers could make overtime pay. Brager remembers herself and others speaking up on the issue, but Sisolak received death threats for being vocal — including from a city firefighter who posted on Facebook that she’d like to shoot him — prompting the county to increase security measures at commission meetings. An arbitrator eventually sided with the county over the union in contract negotiations in 2011, leaving firefighters with a 5.5 percent reduction in total wages and benefits estimated at the time to save county taxpayers $7.4 million. The arbitrator also agreed with the county that firefighters appeared to be treating sick days like vacation days, including one firefighter who called in sick 48 days but worked 92 overtime shifts which allowed him to earn more than $230,000. As a result of the decision, management was allowed to ask for a doctor’s note if firefighters called in sick more than five times a year. The department immediately saw use of sick leave drop, which Sisolak saw as proof of abuse within the system. Even after the decision, Sisolak sent letters to the FBI, Las Vegas Metro and the Clark County district attorney seeking an investigation into whether any firefighters had engaged in racketeering and fraud through the sick leave system. Multiple firefighters were eventually fired or disciplined for their misuse of sick leave. Ryan Beaman, who was president of the union during the negotiations, and current president Steve Thompson did not respond to requests for comment. If campaign contributions are any indication, the wounds from that fight have not yet healed. Clark County Firefighters contributed $53,000 to Republican and Democratic candidates this cycle, including five of the six Democratic statewide candidates. Sisolak, who received more than $50,000 during the campaign from seven other firefighter unions and associations statewide during the campaign, was the lone exception. 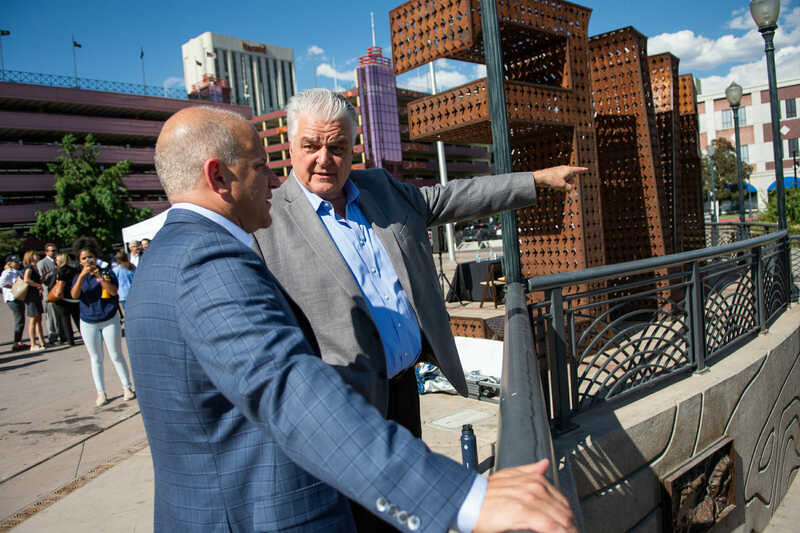 Clark County Commission Chairman and Democratic gubernatorial candidate Steve Sisolak and Marc Badain, President of the Oakland Raiders look at the Truckee River before a press conference in Downtown Reno, on Thursday, August 16, 2018 following a tour of potential sites for a Raiders training facility. Sisolak didn’t reserve his ire just for public employee unions, but businesses, too. “We’re concerned about the fact that potentially you could put drivers that don’t have insurance behind the wheel, that don’t have drug tests, that haven’t been subjected to training and the vehicles haven’t been inspected,” Sisolak said at a press conference, which came as the Legislature was deliberating laws authorizing Uber and Lyft. It was Sisolak who proposed an ordinance requiring drivers with ride-hailing businesses to pay $100 a year in county-level licensing fees, saying they needed to carry their own weight just as other independent contractors do. In November 2015, the commission also approved a $25-per-year fee for Uber drivers operating in unincorporated Clark County, against the wishes of Uber, which called the fee illegal. Later that month, Uber emailed its users and drivers, urging them to flood commissioners with messages opposing restrictions on operating at the airport. Sisolak chafed at the campaign, launched after Uber declined to turn over to the county a list of its drivers who would be going to the airport. The power struggle with ride-hailing companies drew criticism from the Las Vegas Review-Journal editorial board, which said the license fees would squelch a burgeoning business and was unnecessary and onerous, given that drivers already paid a $200 annual business license fee to the state and are regulated by the Nevada Transportation Authority. But Brager characterized the county’s efforts to regulate the ride-sharing companies as an attempt to create an equal playing field between the ride-sharing companies and taxis. Sisolak also got in the middle of a tug-of-war between big casinos and slot parlors such as Dotty’s, a chain of taverns that targets women 35 and older and features a small snack bar and slot machines. Sisolak sponsored an ordinance that would have required that bars make no more than 50 percent of their revenue from slot-machine gaming, aiming to bring them into compliance with a 2011 law specifying that gambling be only “incidental” at a business and not the dominant activity. Dotty’s viewed it as an attempt to put them out of business, but eventually came into compliance with the law by building out full kitchens in many of their slot parlors. Craig Estey, owner of Dotty’s, has not made campaign donations to Sisolak since at least 2011, while he and three of his family members gave a total of $40,000 to Sisolak’s Republican opponent, Adam Laxalt, during the 2018 cycle. By contrast, large casino companies that belong to the Nevada Resort Association — a group that for years has taken aim at the Dotty’s business model — have donated hundreds of thousands of dollars to Sisolak’s campaigns over the years. 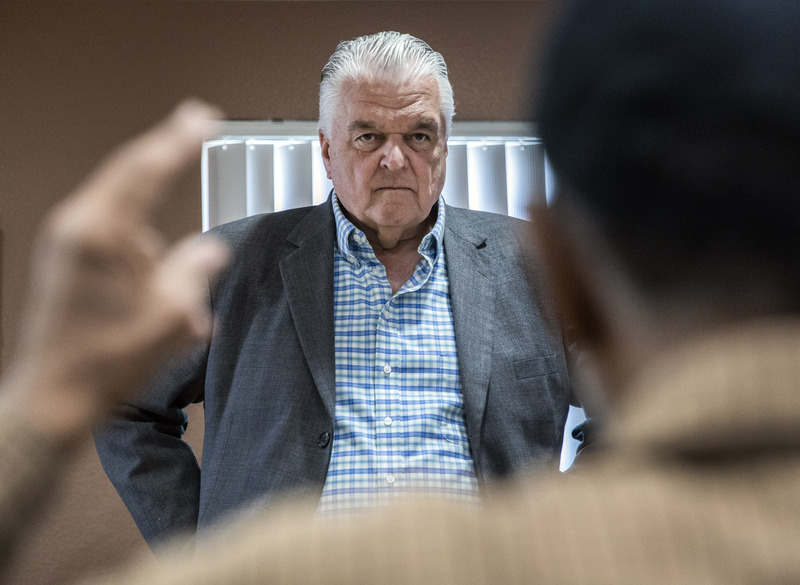 Although Sisolak got rave reviews from many Democrats after his State of the State speech, he still has some strained relationships on the Democratic side of the aisle. The no-holds-barred campaign he ran against Giunchigliani in the 2018 Democratic primary has soured the relationship between the two, who in friendlier times used to have dinner at each other’s homes. He poured an eye-popping $6.3 million in 2018 alone in his attempt to bury her campaign ahead of the general election, and the attacks became deeply personal. Sisolak and his supporters ran ads casting aspersions on the fact that Giunchigliani had paid her husband — respected political consultant Gary Gray — to run her 2006 campaign for commission. The ads cut deep not only because Gray died in an accident in 2015, but also because he ran the 2008 campaign that landed Sisolak his commission seat. After the hard loss, Giunchigliani said she would not vote for the Republican, but still opted not to endorse in the governor’s race. Still, she pointed out that Sisolak will be able to start his term with a budget surplus and Democrats in both houses of the Legislature. “I would say that the primary was pretty ugly on their part, the lies about my husband was a factor but … I’m a team player no matter what, and I wish Steve well,” Giunchigliani said in the KNPR interview. Last month, Sisolak announced that he had chosen Giunchigliani to sit on a marijuana advisory panel that will develop a Cannabis Control Board to oversee the industry, and she had accepted. In an interview, Giunchigliani said she appreciated the gesture and opportunity to serve on the marijuana advisory panel. She hasn’t ruled out a more cordial relationship with Sisolak in the future. But Giunchigliani said she has never been afraid to be her own person, even if it meant clashing with her commission colleague at various points. Kirkpatrick, another former commission colleague, sees Sisolak’s strong personality differently. Virginia Valentine, who was county manager for the first years of Sisolak’s tenure, said she believes he honed his leadership skills when he moved from being a regular member of the commission to being its chair, with more power to drive the agenda and effect change. “I think he’s gone from being one vote to having a more collaborative style. He’s reaching out to more people, he’s gathering more information, I think he’s spending more time not on just understanding issues but understanding how others feel about issues and where others are on issues,” Valentine said. And if Sisolak hasn’t won over all the members of his own party, he counts some fans among Republicans, who see him as someone they can work with. Knecht said he prefers Sisolak over any other Democrat the state might have had. Jackie Valley and Riley Snyder contributed to this report.